1. Spanish scholar, physician, and (probably) Biblical commentator; died at Seville in May, 1345. According to a Spanish tumular inscription of Seville, from which this date is taken, Solomon wrote many works on medical and other sciences, none of which is extant. He is probably identical with the Solomon ibn Ya'ish called "the Elder," a part of whose supercommentary, that relating to the ephod, on Ibn Ezra's commentary on the Pentateuch, is found in Ezra Gatigno's "Sefer ha-Zikronot," p. 139b (Neubauer, "Cat. Bodl. Hebr. MSS." No. 230). A fragment of Solomon's supercommentary which explains a geometrical calculation is in the same collection (No. 232, 2b; comp. Samuel Ẓarẓah, "Meḳor Ḥayyim," pp. 31b-32b, Mantua, 1559). It may be that it is this Solomon ibn Ya'ish who is mentioned by Ibn Verga ("Shebeṭ Yehudah," ed. Wiener, § 7, p. 18) as one of the envoys sent by the Castilian Aljama (assembly of Jewish elders) to King Alfonso. 2. (Solomon b. Ya'ish the Younger ["ha-Baḥur"] of Guadalajara.) Spanish commentator on Ibn Ezra's commentary on the Pentateuch; the whole of his supercommentary is found in the Bodleian Library (Neubauer, l.c. No. 232,1). The copyist Joseph b. Eliezer declares in the colophon that the text from which he made the copy was full of mistakes, many of which he corrected, while many others had rendered the context so unintelligible that he was compelled to retain them. 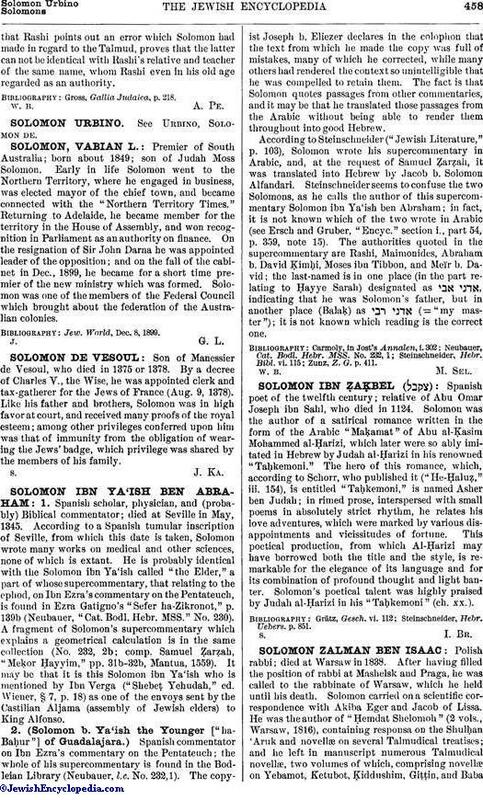 The fact is that Solomon quotes passages from other commentaries, and it may be that he translated those passages from the Arabic without being able to render them throughout into good Hebrew.According to Steinschneider ("Jewish Literature," p. 103), Solomon wrote his supercommentary in Arabic, and, at the request of Samuel Ẓarẓah, it was translated into Hebrew by Jacob b. Solomon Alfandari. Steinschneider seems to confuse the two Solomons, as he calls the author of this supercommentary Solomon ibn Ya'ish ben Abraham; in fact, it is not known which of the two wrote in Arabic (see Ersch and Gruber, "Encyc." section i., part 54, p. 359, note 15). The authorities quoted in the supercommentary are Rashi, Maimonides, Abraham b. David Ḳimḥi, Moses ibn Tibbon, and Meïr b. David; the last-named is in one place (in the part relating to Ḥayye Sarah) designated as , indicating that he was Solomon's father, but in another place (Balaḳ) as (= "my master"); it is not known which reading is the correct one. Zunz, Z. G. p. 411.